We were the only people out skiing yesterday. It was cold again, around 4 degrees when we exited the car. 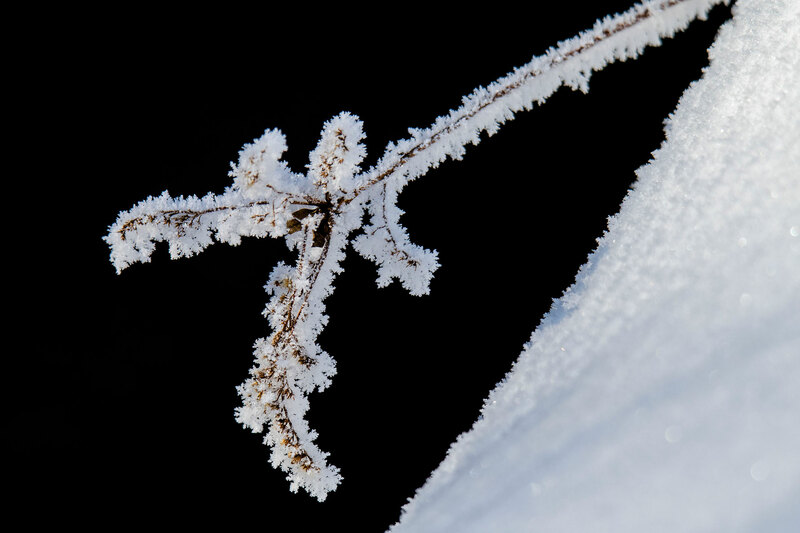 We noticed a lot of frost on the trees and skied down to get some photos. 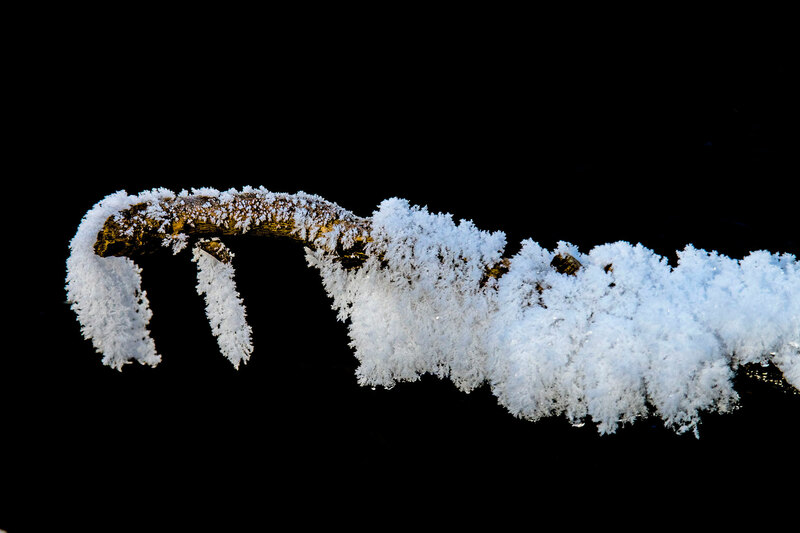 While we were taking photos the wind came up and blew the frost off of the trees and we ended up in a blizzard of frost. 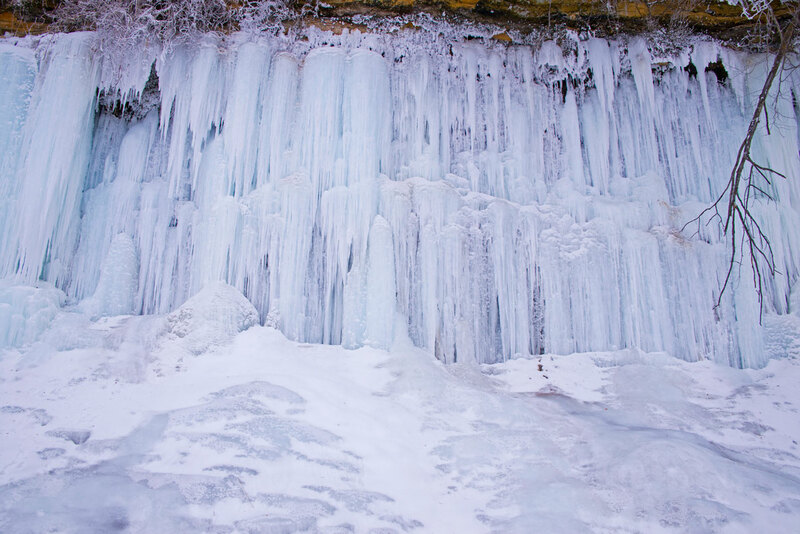 We then skied down to look at the ice wall and check for Bald Eagles. No eagles in sight but we did see a couple near the trail head when we drove into town. The ice wall is looking the best that I can remember. The Bjornson Education-Recreation Center is a project of the Menomonie Public Schools. 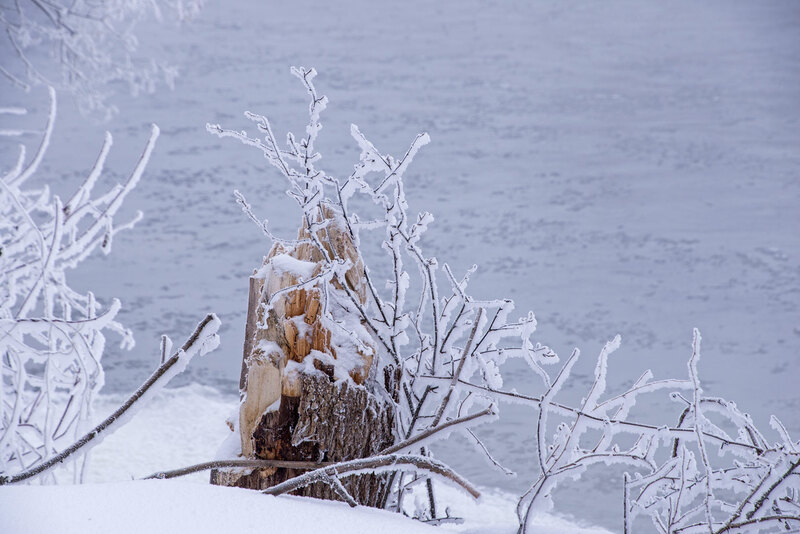 It is open to the public and is a place I like to visit on a cold winter day because of the frost photos. 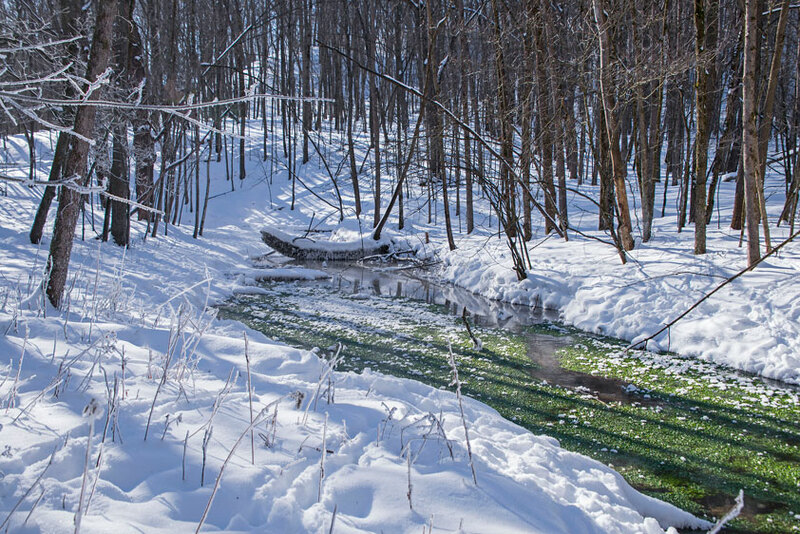 It was about 0 degrees when we woke up and was just the kind of day I was looking for knowing there would be a lot of frost along the spring fed streams in the Center. 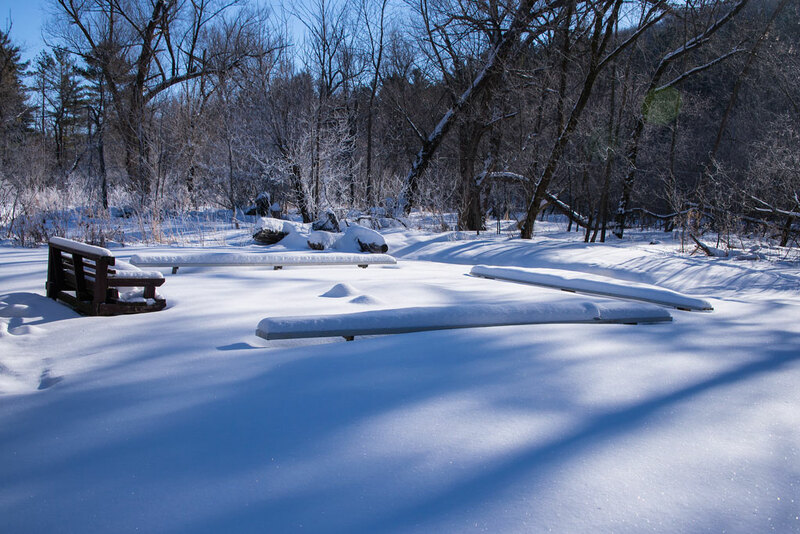 An added bonus was the fresh snow covering the grounds. More photos from the Bjornson Education-Recreation Center can be found on my website. There was a lot of watercress in the stream. 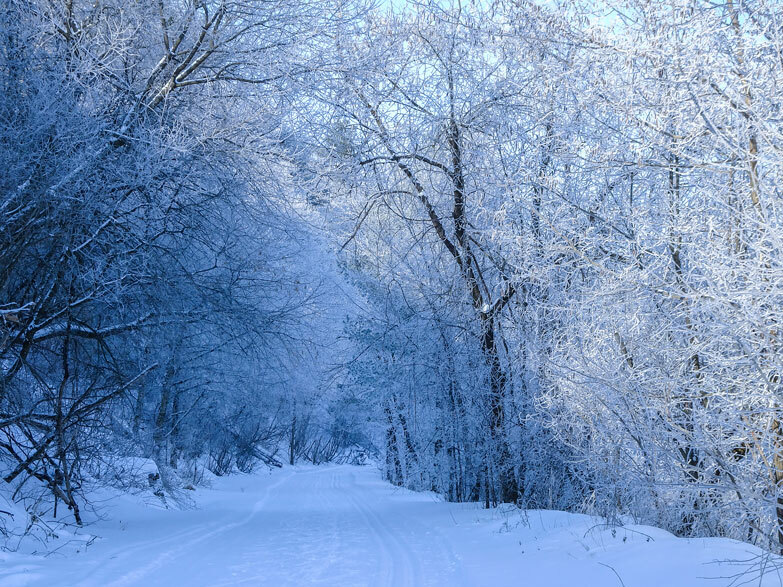 During some of the harsh winters the deer will eat it but it is not high on their list of food sources. 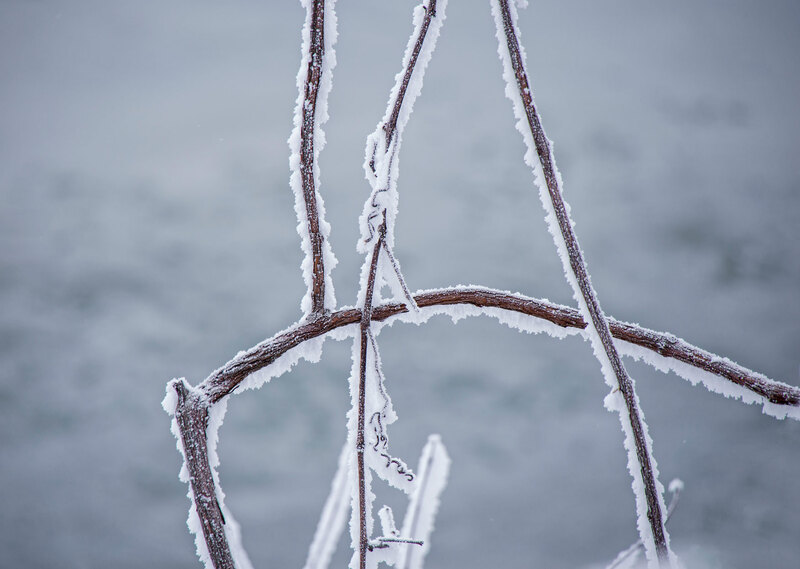 Most of my time was spent photographing close-ups of frost on various objects. I used my 600mm lens for the close-ups so I didn’t have to wade in the stream. 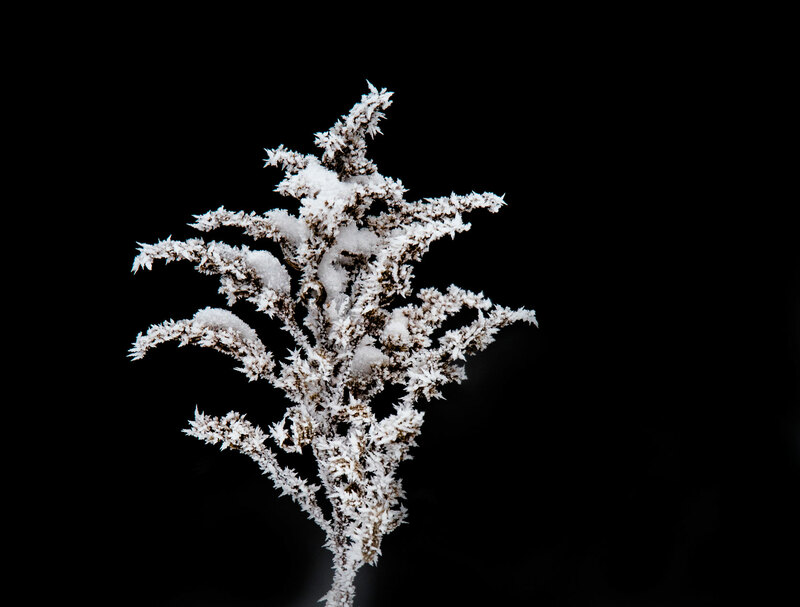 I took a short drive around the countryside looking for frost and found a few places where it was still hanging on the trees. 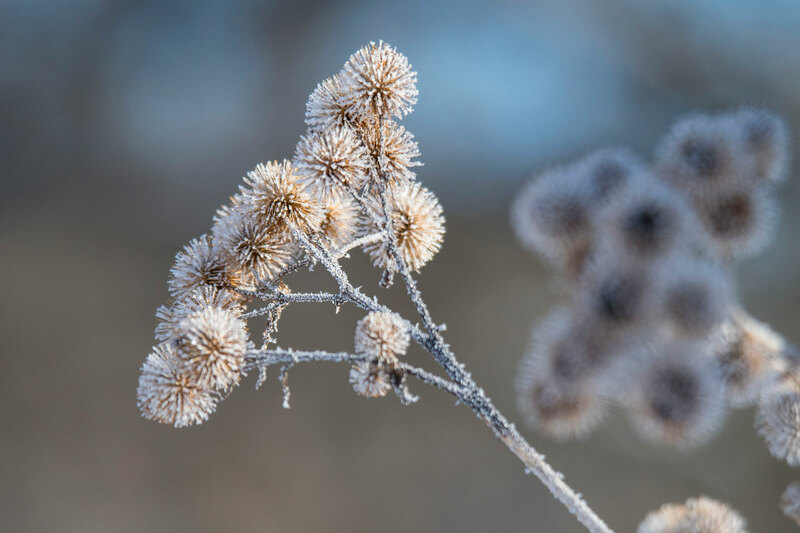 We had several very frosty mornings and most of the flowers and grasses on the Prairie were covered in frost. 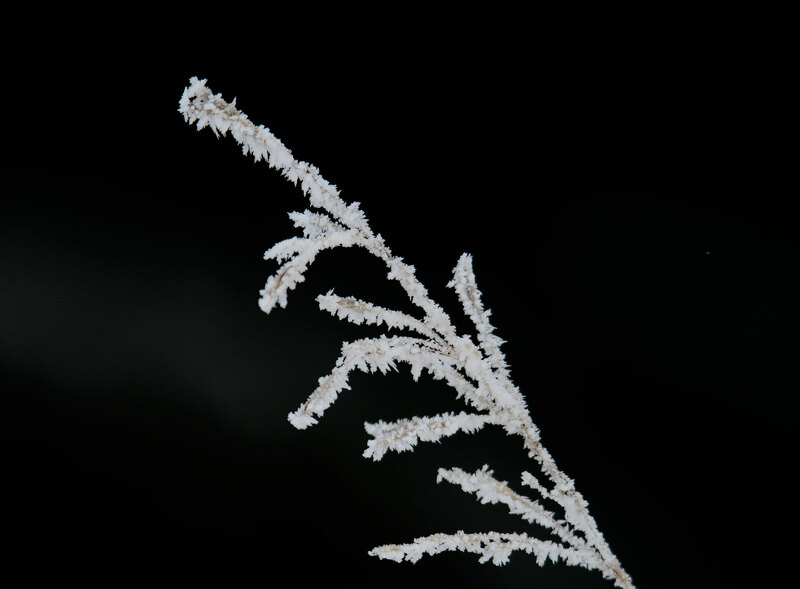 More frost photos can be found on my website. 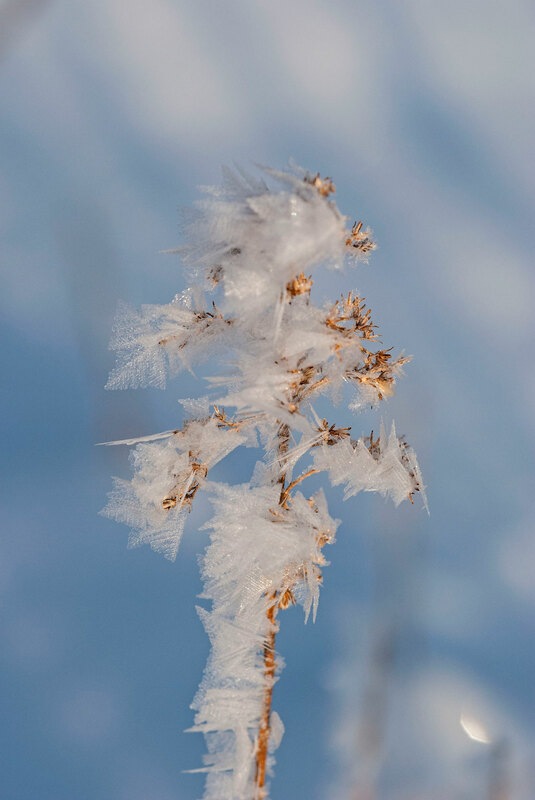 We have seen some cool nights and warm days and the result has been some nice frost feathers in the prairie. 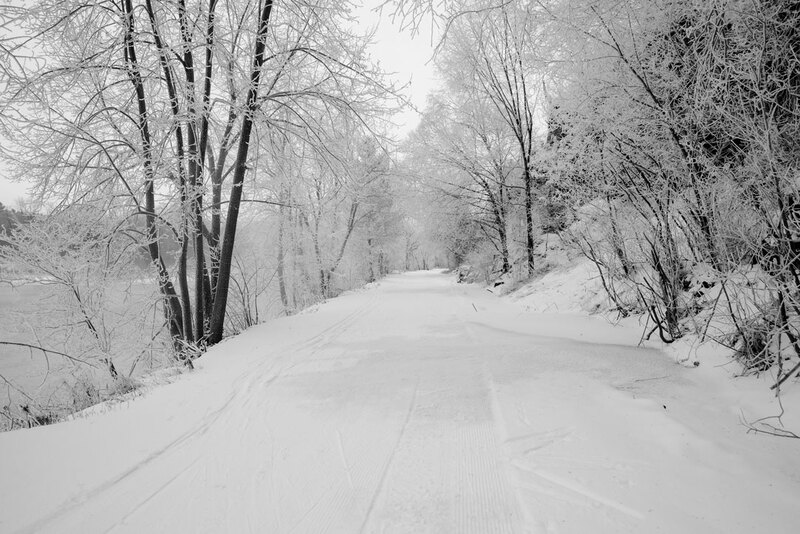 Once again we decided to head down to the Red Cedar Trail for some Cross Country Skiing. It was supposed to start warming up but on this morning it was only about 9 degrees. 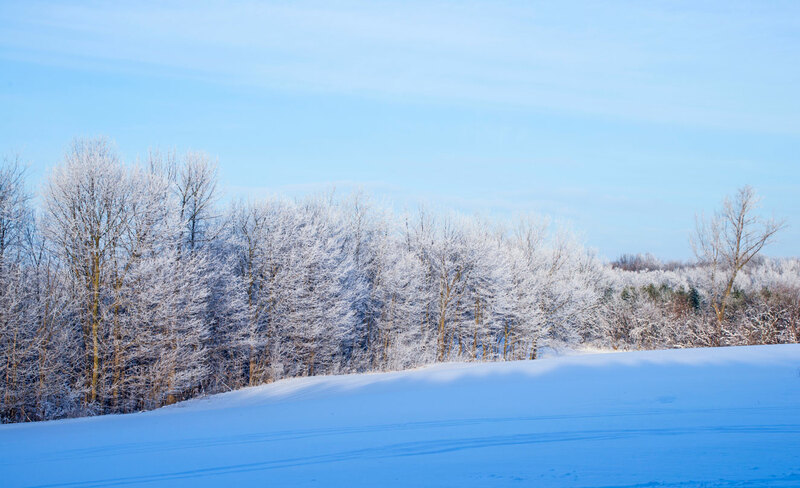 It was cold enough that there was some frost on the trees just south of Irvington. The weather report for the rest of the week was for 30 and 40 degree temperatures which are too warm for skiing. Look like this was our last chance to ski for a while. 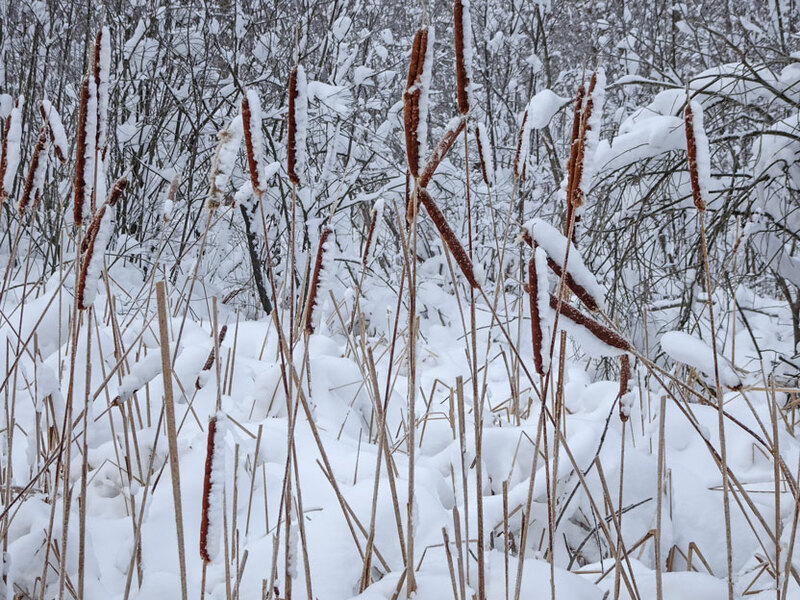 The winter cattails were very striking against the snow. About the 5 mile mark on the trail the snow from the previous day was still hanging on the trees. When we woke up it was -17 and no wind. 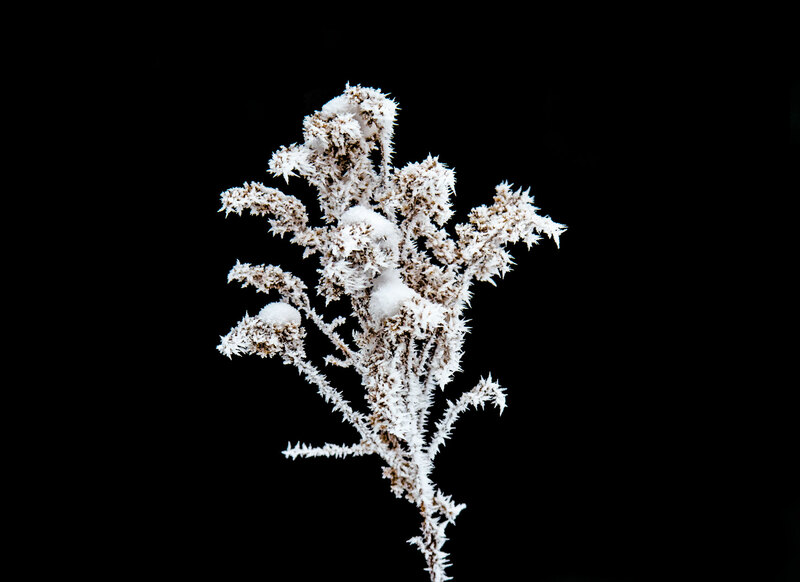 I knew it would be a great day to find some frost along the Red Cedar State Trail. I planned on going alone but my wife didn’t want me out in this weather by myself so she decided to come along. 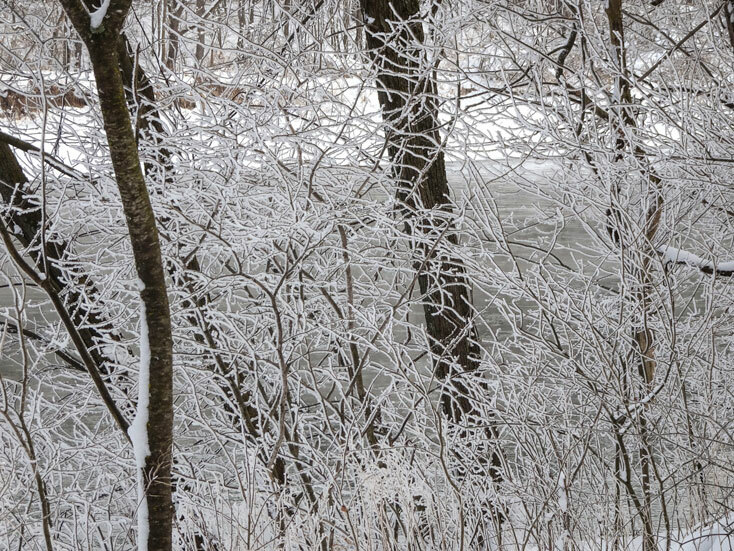 When we arrived at the Irvington Parking Lot we could see the frost covering the trees. 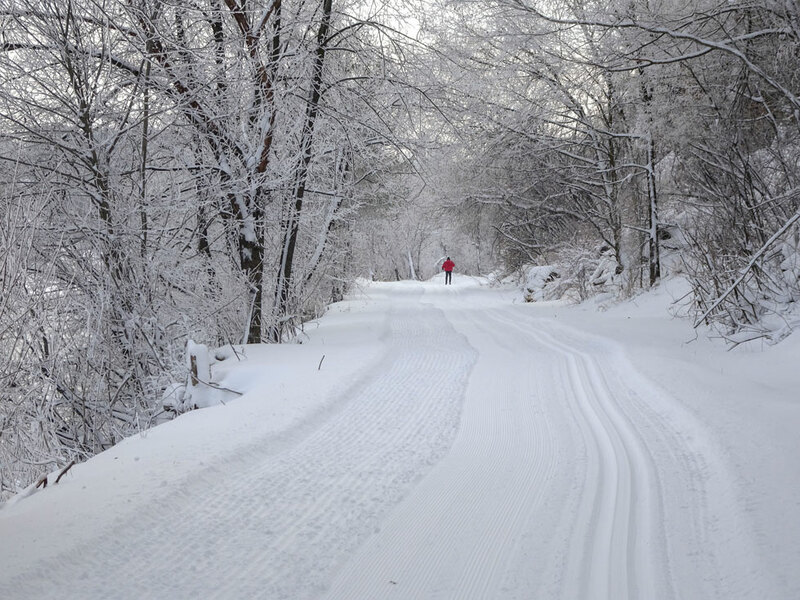 We skied south on the trail for a short distance because that is where the best frost can be found. More photos from the Red Cedar Trail cam be found on my website. We were really cold because I was stopping for photos all the time. 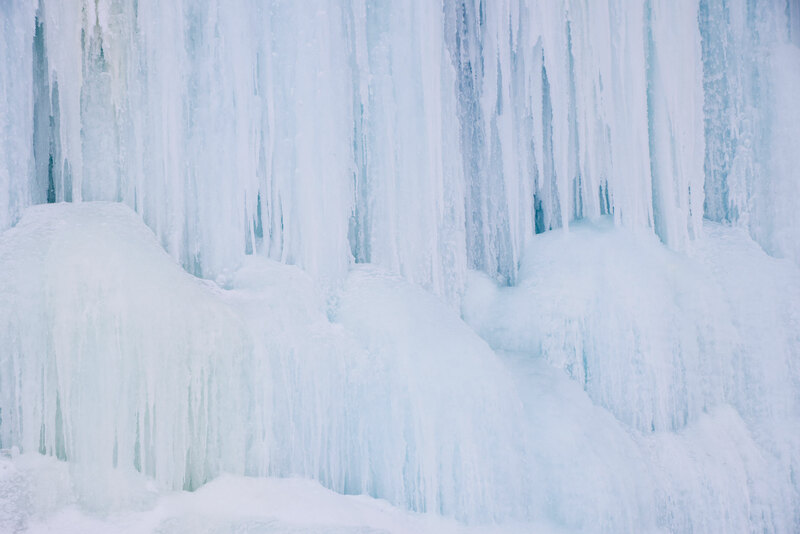 As long as we were on the trail we decided to ski down to the ice wall that forms every winter along the trail. 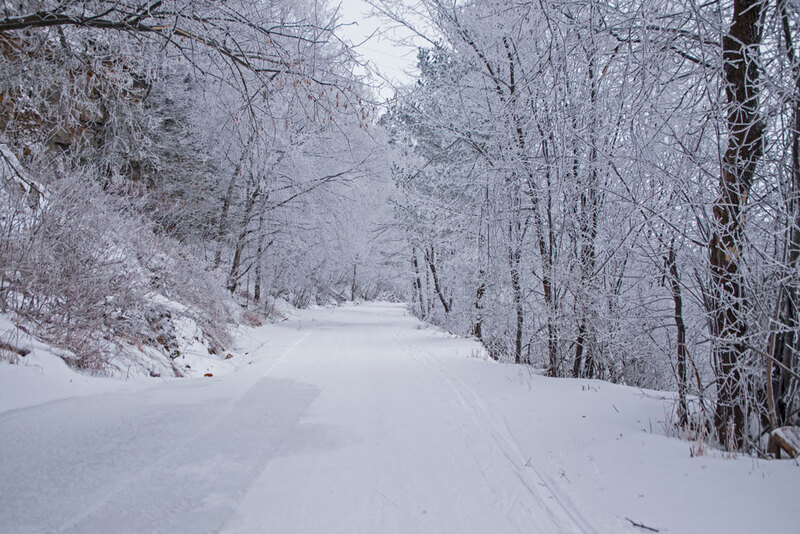 It was difficult skiing because there were quite a few places along the trail where ice was overflowing the trail. 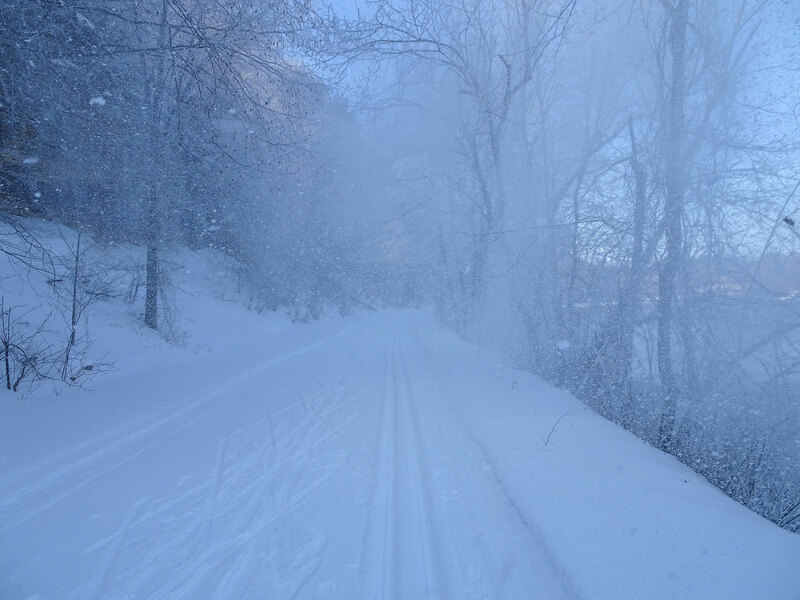 In addition, there was barely enough snow to set a track. 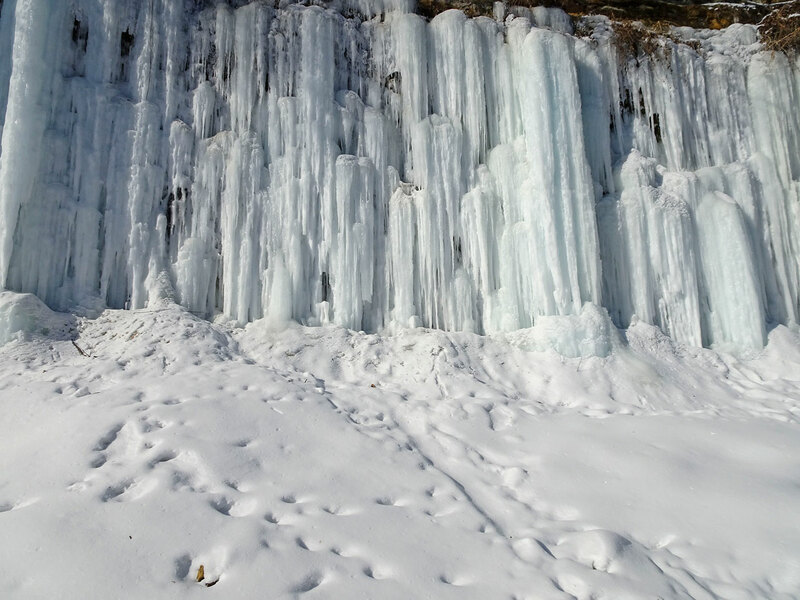 the ice wall was in peak winter condition. 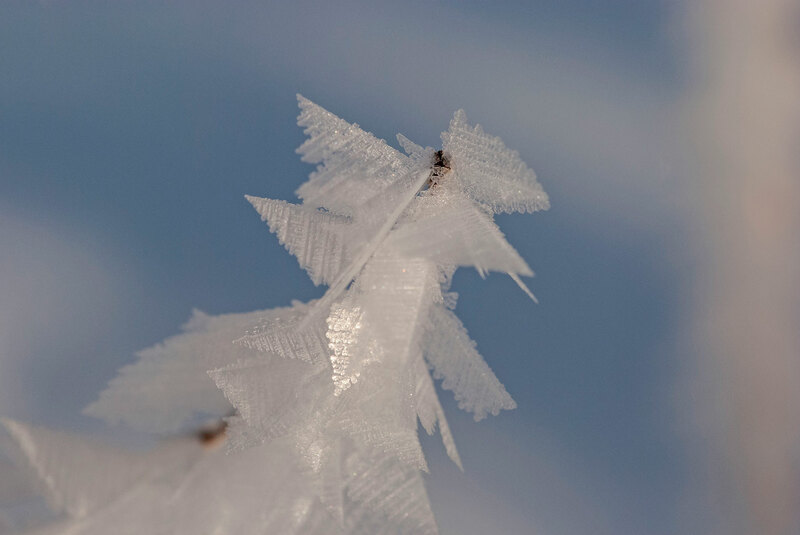 The very cold weather we have seen the past few weeks is ideal for creating ice and frost. 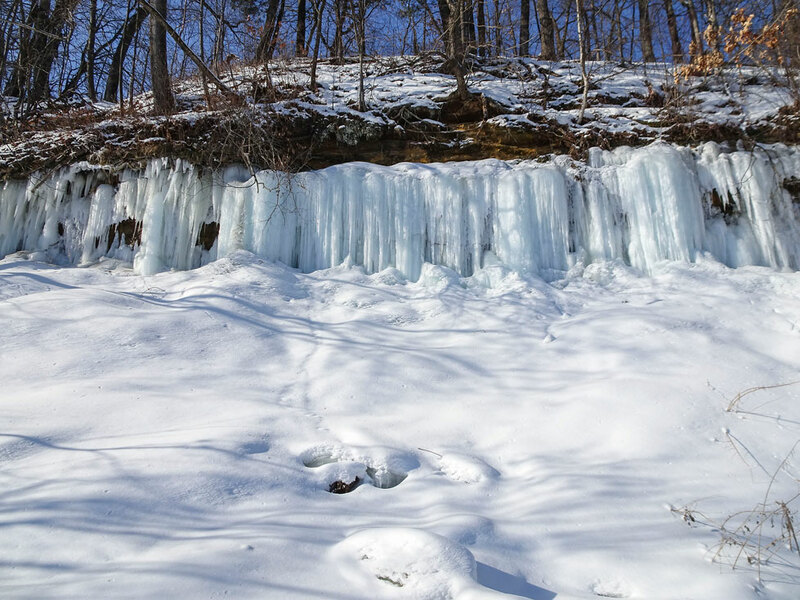 On an earlier visit to Paradise Valley and Devil’s Punchbowl I noticed that the small stream had overflowed and created a large amount of ice. 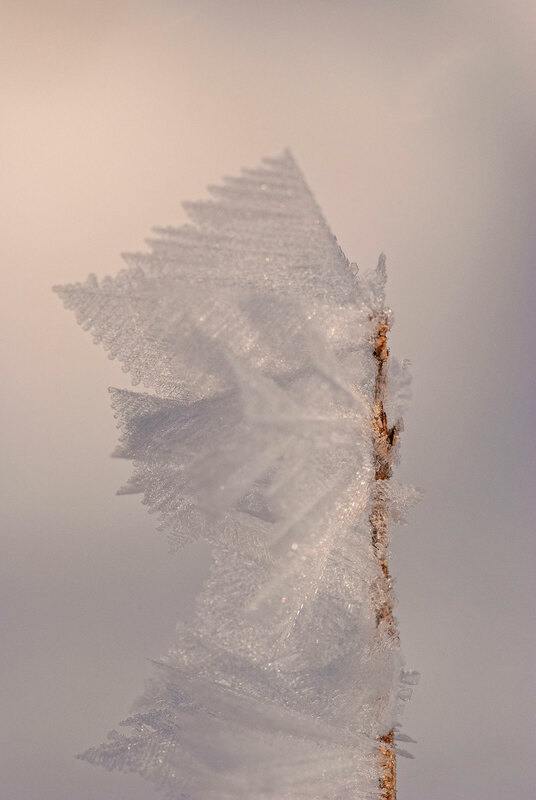 This along with the cold weather created some ideal conditions to form frost feathers. Indeed the ice on the stream was covered with them. I took my macro lens along on the second visit and spent a couple of hours photographing them. More photographs from Paradise Valley and Devil’s Punchbowl can be found on my website. 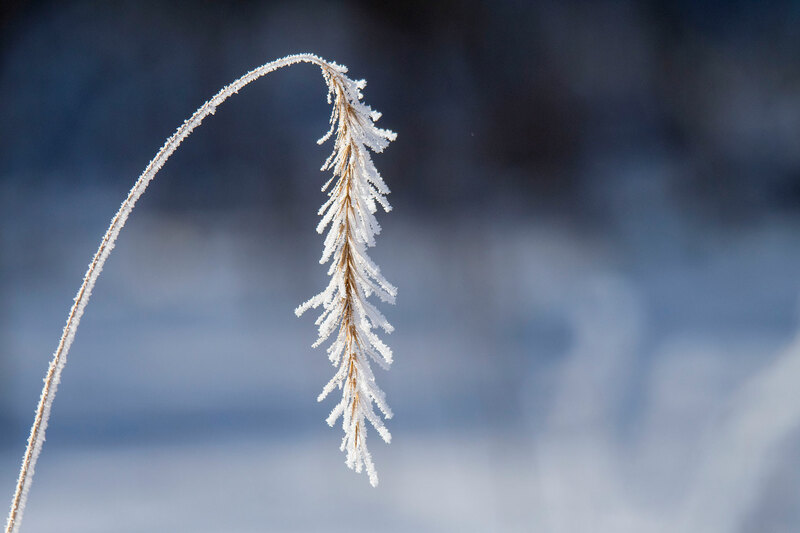 As winter approached we had a number of days with heavy frost so I decided to walk around the prairie on the farm to get a few photos. 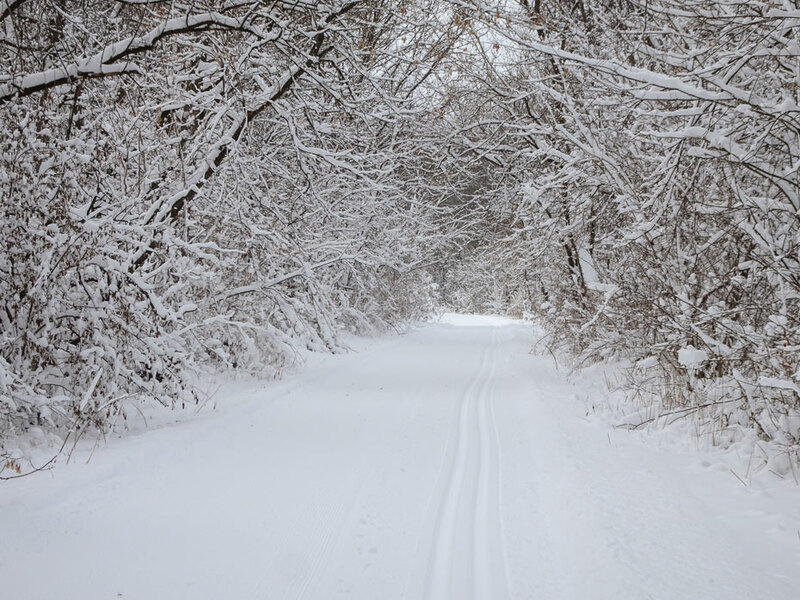 With not enough snow for cross country skiing we decided to drive over to the Bjornson Education-Recreation Center for a hike on a cold day. Bjornson has a number of spring fed streams flowing through it. Watercress usually can be found growing on the streams. 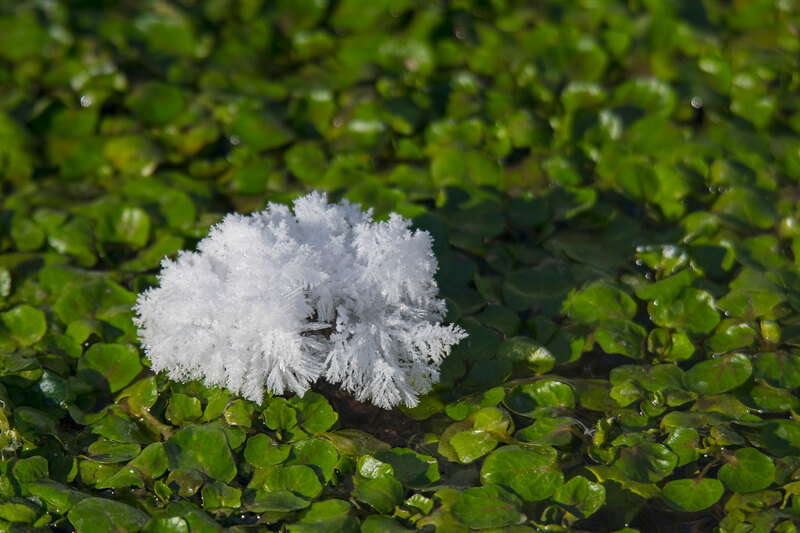 If it is cold out the watercress will be covered with frost flowers. It was a dull day with not a lot to photograph but there were a few weeds sticking up out of the snow that made for an interesting pattern. Further along on the trail we crossed a bridge covered in snow.